Wil Freeborn is one of Scotland’s foremost artists whose multifaceted work straddles the fields of design, illustration and painting. 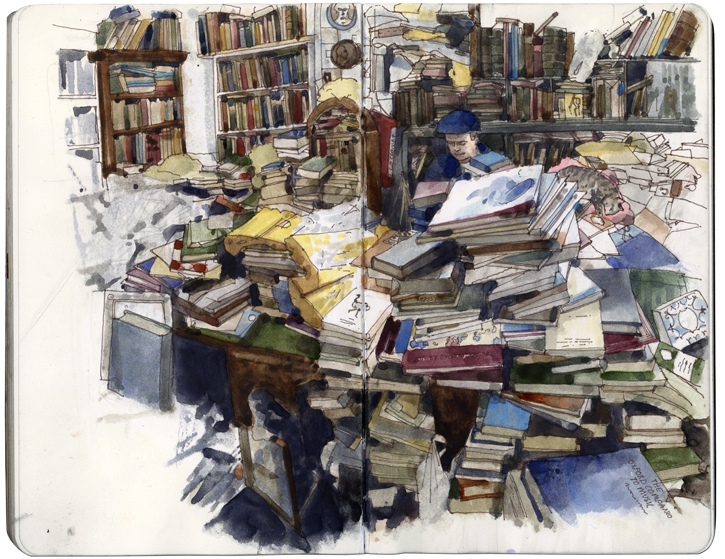 Here he speak exclusively to Claudia Massie about his work and influences, including his experiences working with Alasdair Gray and a discussion on the threatened status of traditional drawing in the modern art school. NLP: Can you tell us something about your background – education, training, how you started out as a professional artist? WF: I went to Glasgow Art School and studied environmental art and somehow got into web design. I worked for a few agencies and then the BBC and started freelance 2 years ago. 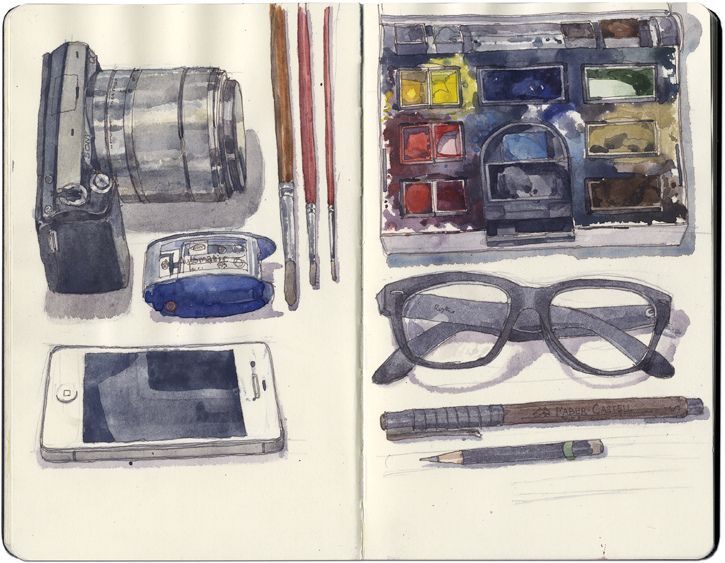 The sketchbook seems central to your work – can you explain its importance and describe how you use it? 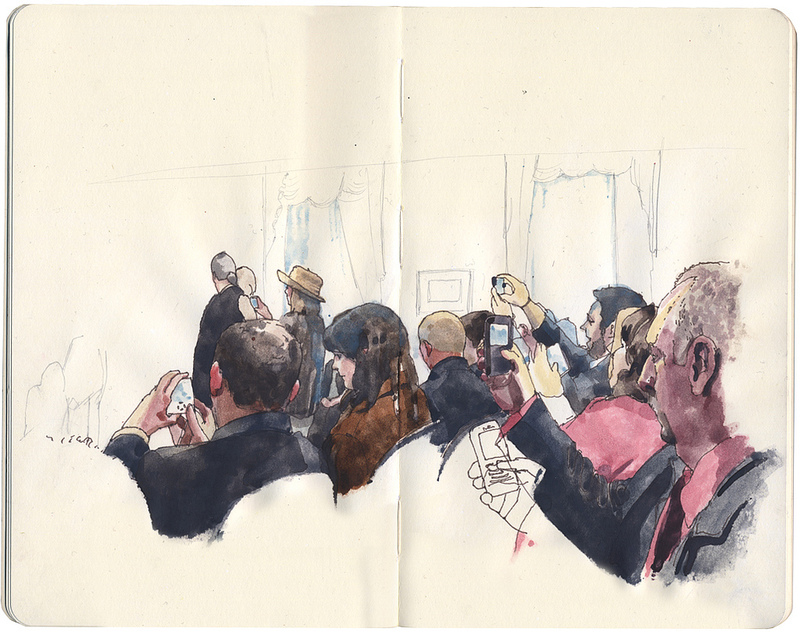 Do you work up these Moleskine images in the studio or are they entirely the result of drawing on the spot? Yes, it started off as something I’d do on my daily commute, drawing people on the train. I’d date every page and try and draw something for each day just to get into the habit of drawing, making it part of my life. When I first started off the sketches were much rawer and true to the occasion. I’d just draw there and then and add a bit of colour then post them later that day. As time has gone on, I’ve changed my approach to do a rough sketch on site making notes than working up a drawing later at home from this and photo references. I may have lost an immediacy from showing the on site drawings but for me it is important to make an image I’d like to show. Processes have changed from even adding quick watercolour washes that used to take a few seconds to taking the time to try and render form and light. Its a trade off that I’m happy to take. I try to keep my materials as simple as possible. Travelling about I have a very basic kit of just a few pencils and pens (Faber Castell Artists pens). With watercolours I like a really simple palette and have been trying to narrow down my choice of colours. It was a small revelation to find that the colours you initially get with a watercolour kit are unsuitable, they’re just too bright and basic. Over the years I’ve replaced most of these. Your style is distinctive – clean and sharp but with a painterly edge to it as well. Who (or what) have been your primary influences and how has your approach developed over the years? Thanks, most of my influences have been illustrators I guess that shows in my work. Illustrators such as Eleanor Davis’s bright watercolours and goache, Paul Rogers‘ clean lines, Martin Etienne’s drawings of Paris – and from an earlier time, such greats as Edmund Dulac, Arthur Rackham and Carl Larson. 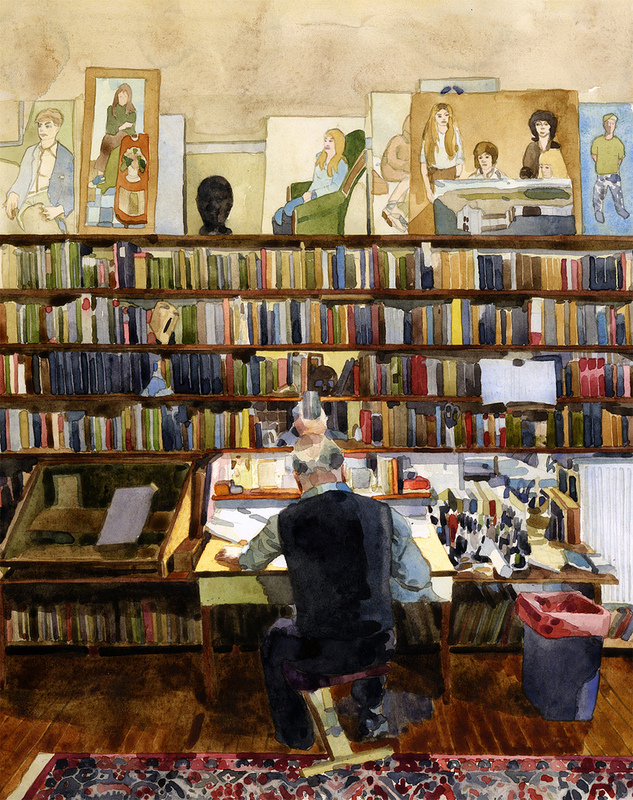 Also painters such as Alex Kanevsky’s figure paintings, Euan Uglow, Valerius de Saedeleer’s Dutch landscapes and James Paterson’s Thornhill paintings. Over the last couple of years I’ve been moving away from just showing sketchbook work and moving to paintings. It was quite easy to get caught up with the relative safety net of a sketchbook and it feels like a leap of faith to work towards more finished work. Drawing wise I’ve been trying to get a story across rather than showing one image. My first attempt at this has been a series of drawings based on the Faslane Peace Camp. I went and visited them 3 times to get a better picture of what its like there and try and get a different perspective of the environment and the people. Its more time consuming but for me and hopefully everyone else its a bit more rewarding. The work on your flickr stream is like a tour of life in Glasgow and beyond – buildings, shops, events – but your observations of people really stand out. Your ability to capture form and gesture is remarkable and your life drawings are fine examples of classical draughtsmanship. Life drawing has always seemed to me to be a fundamental skill – how do you feel about this and about its diminishing role in the modern art school? 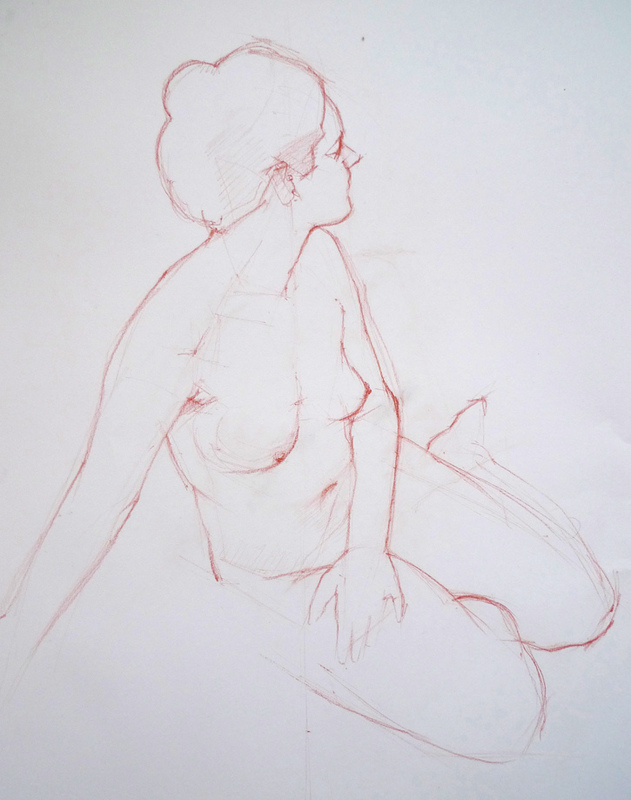 I first started getting back into life drawing by going to evening classes at Glasgow Art School. I was lucky to get taught by Cynthia Bowles who has a real understanding of anatomy and colour theory. Without doubt it really changed how I saw drawing which I’m forever grateful for. As soon as you try and convey form and structure when drawing from the figure you feel like you’re always learning more each time you draw. I was reading an interview with Jenny Saville in the Guardian: she went to Glasgow School of Art, an institution that instilled in her an “amazing” work ethic, and which set great store by life drawings; students had to produce 36 such sketches a term, and dedicate the hours between 7pm and 9pm every day to working with a model, even if their interests lay with abstract art. By the time I got to GSA not long after Jenny Saville this practice had pretty much disappeared. There is now just one small available class with no actual teaching at all. I’d love there to be more life drawing, but I get the impression that drawing has moved over to illustration. It would be inspiring to see more painting or life drawing but there needs to be a demand for it or it comes from the institution top down. I know someone who has just gone to Edinburgh and she has to organize life drawing sessions herself outside the art school. You had some involvement with the Maryhill Art School – an institution which sought to address this very issue by providing the best classical art education. Sadly MAS has been afflicted by financial troubles and has had to shut down for the time being. Do you think there is a place for such an art school in the modern art world? Maryhill Art School was a great idea and will be sorely missed. I’m certain there is a place for it, it would be inspiring if it was a place for kids to go to before they went to art college (sorry for saying kids, young adults?) In that environment you could learn figure drawing and painting techniques. I think from that start you could foster a love for painting in art college that wouldn’t necessary need to be classical but could start an entirely new way of painting. Or how about making such a place part of an art school, a wing dedicated to classes and a teaching environment, radical! You have also worked with Alasdair Gray producing a mural. What did that involve on your part, how did you enjoy the experience and what did you learn from working with him? Working with Alasdair Gray was a great experience and I learnt lots from it. It was for a mural that will be installed in the Hillhead Underground station in Glasgow based on an overhead view of Hillhead. We would walk about the area taking photos of the streets then work with the overhead view from Google to create a 3/4 view (almost isometric). Alasdair focused on making sure each image was a true construction, they all had to work. It may be obvious but roofs had to meet the walls correctly, chimneys had to be correctly positioned. Like drawing anatomy I needed to learn how the building was put together. It gave the buildings a type of realness within its own parameters. As the perspective didn’t get smaller, everything had to make sense in the world of the mural rather than real life. I need to mention the sheer will and hard work from Alasdair that keeps the project going and the people such as Nichol Wheatley and team that makes it happen. It should be on display in September this year. The term ‘illustrative’ when applied to painting is usually meant in a derogatory way. What do you feel about this? When does an illustration become a painting, or do you feel there should be no distinction? I’m not sure there are many painters who are also illustrators, such as James Jean, Sam Weber and from Scotland Lindsay Carr. With the help of the internet they have a got a good audience who love their work in a way many fine art painters would be jealous of. Life as a freelancer can be unpredictable and unreliable. How do you manage the demands and stresses? It’s a work in progress, there are good busy times and also occasions which are worrying. In quiet times I do self initiated projects which are really important to me. What projects do you have upcoming and are there any particular things you would like to work on? I’ve got a small book that I need to finish which is from the last couple of year’s drawings. I have 3 paintings which need to be completed and I’m aiming to do a show next year. There are also some stories I want to do, which will be an ongoing thing. So keep an eye out on this space! 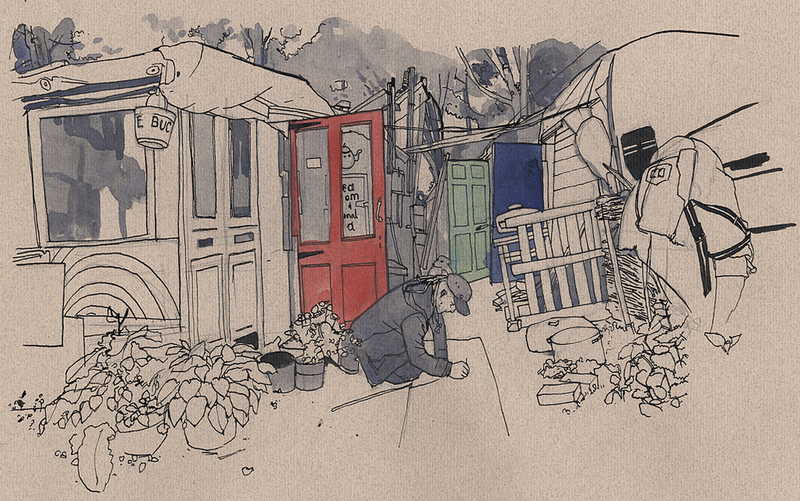 Wil Freeborn is a designer and illustrator living and working in Gourock, Scotland. See more of his work here.